One year after our acquisition of 25 Webster Avenue, we are proud to reflect on the improvements we have made to one of our new favorite buildings.. When we first toured the property in 2016, we saw that significant upgrades were needed to bring the building up to Mount Vernon Company standards. Many of the finishes were original to the building from 1988, including the ever-present white cabinets with wood trim that were all the rage back then, worn out carpet, and gold light fixtures. We chose a grey and red color scheme for the common areas, a big improvement over the faded pink carpets on the upper floors and yellowing-white walls. For the interior of the apartments, we installed hardwood flooring to replace the carpet. The kitchens and bathrooms received full upgrades. To top it all off, we added laundry in every apartment, renovated or not. 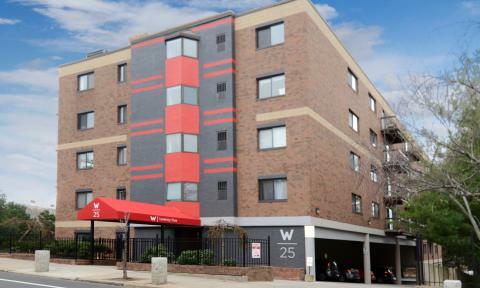 25 Webster has become one of our most valuable assets in one of the area’s fastest growing neighborhoods.